Ready for liftoff? Build your own rocket launcher! 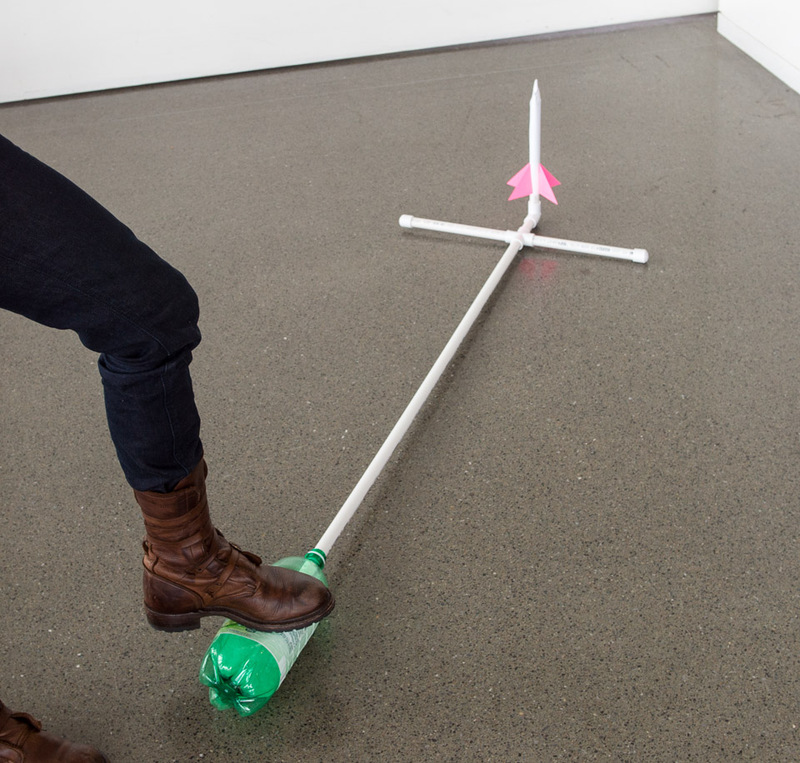 Experiment with rocket designs and a PVC launcher to discover how high—and how far—you can make your rockets go. Note: The exact lengths of the PVC are not critical. Ask your hardware store to saw your PVC pipe into the lengths you need. If they cannot accommodate this request, you’ll also need a hacksaw blade or PVC cutters. If you’re using a hacksaw blade, wrap one end with duct tape to make a "handle" so you can safely cut the pipe. Attach your longest and shortest pieces of PVC pipe to opposite sides of the quad joint. Add a 1-foot (30-cm) length of PVC pipe to each of the remaining openings on the quad joint. Put an end cap on each of the ends of the two 1-foot (30-cm) lengths of PVC pipe that you just added to the quad joint. Add the PVC elbow, facing upward, to the open end of the 3-inch (8-cm) length of pipe. Add the third 1-foot (30-cm) length of PVC pipe to the end of the elbow. This is the part of the launcher where the rocket goes. Notice that the angle can be changed by rotating the elbow relative to the base of the launcher. Slip the 2-liter bottle over the end of the longest piece of PVC pipe and you’re ready for launch! To make the rocket’s body, roll a sheet of 8.5 x 11 (A4) paper into a cylinder that will fit over the launcher-end of your PVC assembly (see photo below). Don’t roll the paper too tight; you should be able to easily slide it off. Tape the paper tube so it stays rolled up. Slip it off the pipe, and then, using your scissors, clip one end of the tube in a V to make the pointed “nose” of the rocket (see photo below). Use tape to seal the point so it’s airtight. Finally, you can add fins, which will help your rocket fly straight. To make them from a 3 x 5 index card, fold the card in half to make a short rectangle. Then unfold it, cut along the fold line, and stack the two halves. Draw a line from one corner of the rectangle to the other, cut along it through both halves, and you’ll have four triangular fins (see photo below). Tape the fins to the sides of the rocket at the base. Be sure to tape both sides of each fin to the rocket. Now that you’ve got both a rocket and a rocket launcher, you’re ready to go. Find an appropriate launch site without overhead obstacles (wires, ceilings, trees, etc.). Make sure no one will be in the path of the rocket, and then you can start your countdown. When you’ve got your technique down, experiment to see how changes to your rocket will affect its flight. Roll your sheet of paper the long way instead of the short way (or vice-versa) and see what happens. Try out a new fin shape or a different angle for the V of the rocket’s nose. Can you think of other designs to experiment with? Build new rockets, predict how they’ll fly, and see what happens. In order to move through the air, a rocket has to push air aside. Things that are designed to travel quickly, such as sports cars and jets, are shaped to minimize the amount of air they push aside to move forward. 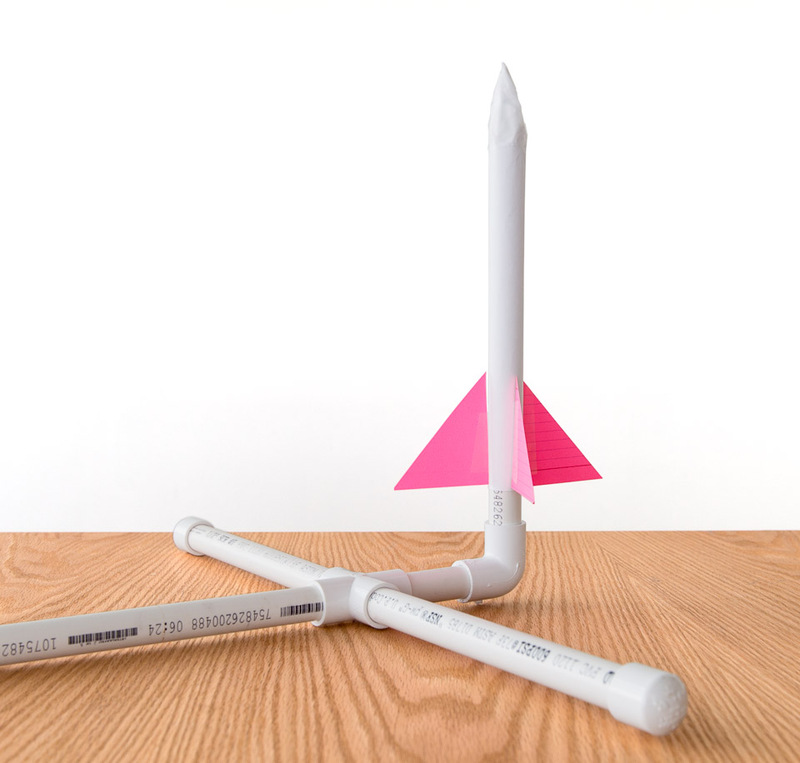 Your paper rocket has been designed to move through the air efficiently, too. The V-shaped nose helps it cut through the air as it flies; the fins help keep the rocket moving in a straight line. If you tried two different-length paper cylinders for your rocket experiments, you may have noticed that the longer rocket flew further/higher than the shorter one. This is because a long rocket body has more distance (length of rocket) over which the force of the air from the PVC tube is applied, which increases the amount of time during which the force is applied. As the air expands into the pipe and rocket, however, the force decreases, so there is some optimal length of rocket where force and time are maximized. The launching force is created by stomping on the 2-liter bottle. Increasing that force will make the rocket go higher/further. The change in velocity is proportional to how much force you apply and the time during which the force is applied. The change in velocity is inversely proportional to the mass of the rocket. Therefore, lighter rockets tend to go further/higher. These variables—the force of the stomp, the length of time during which the force is applied to the rocket (which, in this case, translates to the length of the rocket), and the mass of the rocket—all affect how high and far the rocket flies. With an additional PVC elbow, another 1-foot (30-cm) length of PVC pipe, and one PVC T-joint, you can rearrange the pieces of your launcher to launch two rockets simultaneously. (Hint: Start by replacing the two end caps of your original design with the two elbows.) How would a “double rocket” launch affect each rocket’s flight? If you want, you can also measure the height of a rocket’s flight using the inclinometer in the Height Sight Snack. To use the method described there, the launch angle of the rocket would need to be 90 degrees, so be sure to launch the rocket vertically and keep both eyes open as you track its flight. If you have several people measuring the rocket's flight, you can average their inclinometer measurements to most accurately determine the rocket's height. If only one person is measuring, try launching the same rocket several times, and record and average those sets of measurements. If you blow harder, will it go farther? Find the height of a tree, paper rocket or North Star.